With the number of Thoroughbreds at Fair Grounds Race Course testing positive for equine herpesvirus type 1 (EHV-1) more than quadrupling between Jan. 12 and 13, both the Louisiana Department of Agriculture and Forestry (LDAF) and track officials are scrambling to improvise temporary stabling on the property in an effort to keep infected horses separate from the general population. 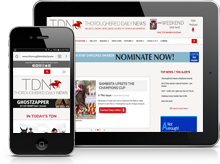 “We now have 39 quarantined horses,” LDAF commissioner Mike Strain, DVM, told TDN in a Friday evening phone interview. “There were nine [Thursday], and now it’s 39. So we’ve had an additional 30 horses test positive that have been moved from isolation into a quarantine barn. They’re working with temporary tents, and that’s the next issue we’re going to look at, how to increase our capacity. We’re working on that now. There will be many issues that we will face, because this is a very large facility with a lot of horses. On Thursday, the LDAF announced that the state is mandating a no-horses-in-or-out quarantine that supersedes the separate on-property segregation of EHV-1 positive horses. Since the initial outbreak in December, Fair Grounds had been enforcing a similar private policy that restricted movement in and out of the stable area, but now the state is officially backing the mandate. Despite the markedly lower number of available on-track horses to fill races and the ban on ship-ins, Fair Grounds has soldiered on without having to cancel any cards, although both the Thursday and Friday programs consisted of only eight races. Neither Jason Boulet, the senior director of racing for Fair Grounds, nor Brad Bryant, the track’s senior director of operations, responded to Friday phone messages requesting comment prior to deadline for this story. Strain said that horses housed in the six barns that have been individually quarantined were mandated to be tested for EHV-1, even if they were asymptomatic. Horses stabled in the 43 barns where no positives have occurred can continue to race and are not subject to testing. “Any barn where there’s been an animal that has been ill and has tested positive, then that entire barn goes under quarantine individually,” Strain said. Those positive horses are removed to isolation and treated, he explained, and the remaining Thoroughbreds are given a second EHV-1 test within 72 hours. If all the results of that second test are negative, then the quarantine “clock” for that barn begins counting down. After 14 days, another test will be administered, and if all the horses remain negative after that two-week period, the barn will be released from quarantine. Strain said the owners of horses are responsible for paying for all of the tests. He would not cite a ballpark cost. For perspective though, a web page for the Cornell University College of Veterinary Medicine lists the fee for a respiratory PCR panel, which is typically used to test for EHV-1, at $115. Strain emphasized that the entire Fair Grounds horse population is not required to undergo testing, and that only horses deemed to have been potentially exposed to EHV-1 must get tested. Strain said those horses are in “scattered” isolation facilities, but he was not at liberty to reveal specifics.